I’ve been reading a lot of comics this month as I prepare for my “Comics That Challenged Me 2017” feature that will run at the end of December and the beginning of January. In an attempt to have a better rounded understanding of the publishing output of 2017, I’ve enlisted the help of the local library and their interlibrary loan program to get access to comics printed in 2017. One small but growing subset of these books are webcomic collections. Webcomics are a nebulous enterprise from an economic standpoint. They make money in a few ways, but generally it’s through ad revenue, sales of merchandise, patronage systems (Patreon, Drip), or sales of printed comics. Most of the time these printed books come out of a Kickstarter sort of enterprise, but more and more recently collections are being published by comics presses like Iron Circus and Image. I recently have run into a couple of these books that have been depressing, more because of the way they’re constructed or the way they’re published than the comics they contain. 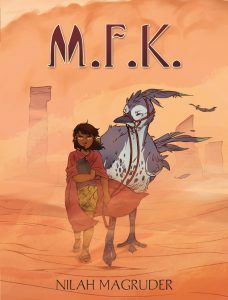 A great example is M.F.K., by Nilah Magruder – it’s a science fiction comic about two kids, Abbie and Jamie; Jamie is an orphan whose parents abandoned him as a child, and Abbie is a stranger Jamie and his grandfather find injured on the edge of the desert. The two grow closer together as Abbie’s past is revealed, and an attack on the small town of Little Marigold causes the two to spring into action. 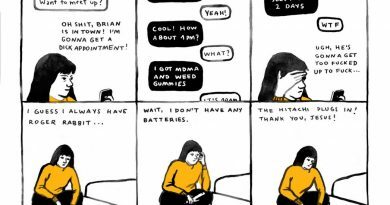 Magruder’s comics are serviceable and the characters are relatively well-constructed. The book itself is a $25 hardcover with large page format, full color, 128 pages, and covers the first 3 chapters of the webcomic. 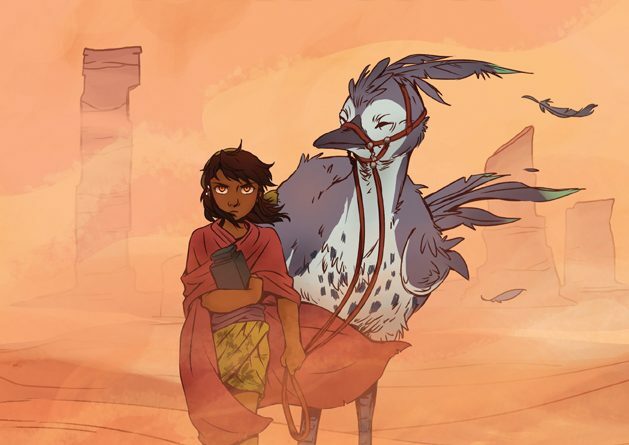 But it’s clear that Magruder is in for the long-haul with this comic – the first three chapters are the bare bones introduction to the world and the characters she is building. That makes a single collected volume feel… underwhelming, to be polite. Imagine that you spent $25 to see Star Wars 8, but the projector died in the middle of the first act. That’s what the first volume of M.F.K. feels like – like I’ve seen 20 minutes of a 2.5 hour movie, and I’ve been forced to leave the theater. When it comes to traditional pamphlet superhero comics, the price to entertainment ratio is one of the lowest in the entertainment industry, but this kind of publishing is worse – the pacing is glacial in comparison, the action is slow to kick off, it just doesn’t go anywhere. If you’re reading this to be entertained, my guess is that you’re going to be disappointed. Bluntly, M.F.K. isn’t built to read the way a book like this is supposed to read, and suffers for it. This isn’t to say that M.F.K. and comics like it don’t deserve to be printed, but I think it’s important to think about the scope and pacing of the work. As a print object, does every page of the webcomic need to be collected? Can the work be edited, pages added or subtracted, to make a more convincing whole? 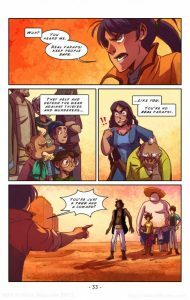 The needs of a webcomic, which may be published page-by-page, 1-2 times a week, are much different than the needs of a book, and to believe that you can easily convert one to the other successfully is trying to put a square peg in a round hole. Part of the way webcomics work is the anticipation for the next page – but in a collected edition, that page is just a flip away, not a week away. The immediacy of the change in action, the immediacy of the page turn makes demands on the cartoonist that webcomics doesn’t. Ultimately this is an editorial problem. Artists collecting their own work for Kickstarter may not have that kind of funding or institutional support, but it’s incumbent on any publisher printing these books to make these editorial decisions. There are a lot of fine comics out there that could be good or great with an editor. And, let’s be frank. It’s clear that these are editorial considerations that are not happening, because M.F.K. vol. 1 exists as a book as it currently stands. That’s on Insight Comics’ head, not on Magruder’s. And that is unfortunate, because while I think M.F.K. is an interesting comic in terms of concept and character, you couldn’t convince me to buy a second volume of this book based on the first volume alone. Sequential State is supported by readers like you on Patreon. If you found this essay interesting, or like the work I’m doing with the site, please consider being a patron. Thanks! This is a false equivalency; the Star Wars analogy is just wrong. You are entitled to believe that they should edit the comic down so the pacing is quicker, but paying someone purchasing the comic knows, contrary to your suggestion, what they’re getting themselves in for. To correct it, if you spent the $25 on the book and it arrived with only 100 pages missing it would be equivalent to watching a film where the projector cut out. It is in fact like watching the first Lord of the Rings film, or the first Star Wars film to use your analogy. It is not the artist or the publishers fault that you didn’t know what you were buying and don’t know how analogies work. Hey, thanks for the feedback. I’ll endeavor to be a better analogist in the future. I don’t put any stock in this being an artist problem – it’s an editing problem, which is on the publisher. The publisher’s job is to sell books, right? They do themselves a tremendous disservice in that regard if they aren’t thinking about the pacing of these comics.